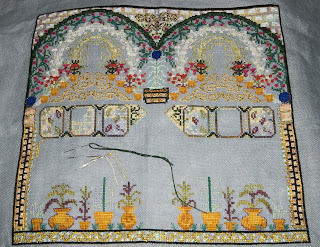 The plaques are coming along on this; the light pink and light blue for the flower outlines in the dense ones are done. It seems the middle plaques, with the least stitching to do, are the ones falling behind. I've done some work since this picture was taken, but not much. 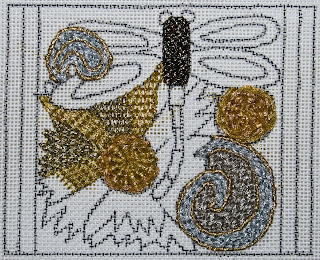 For some reason, I haven't really stitched this week. After resting, we spent the morning walking Budva (again). Parts of it reminded me of the Jersey shore, with a boardwalk/carnival feel. That was the area behind the beach farthest from Stari Grad, which you can see in the first picture here. 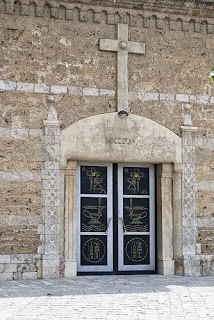 This is one of the churches; there were two - one Roman Catholic, one Orthodox. The whole old town is made up of the same stone. Touring every street of it takes about ten minutes. There are some fairly nice restaurants inside. And here is part of what the crowds were about - one of the cigarette boats being taken out of the water to be transported back to the starting line. While we were there, they were still doing time trials. Noisy to hear and exciting to see. This is a shot of some of what's normally in the harbor. Boats range from dinghys to yachts. And, as usual for around here, the sky is a lovely blue and the water is a great bluish green. The water in the boatyard wasn't as clean as what we've been seeing in Croatia, though. 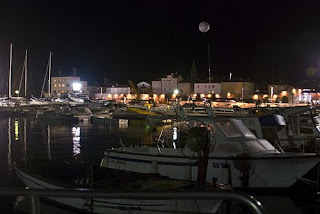 If you want to see more pictures of Budva, follow the link in my previous "Night in Budva" post. There's an excellent panorama there. Well, it is except for the beads I put on last. 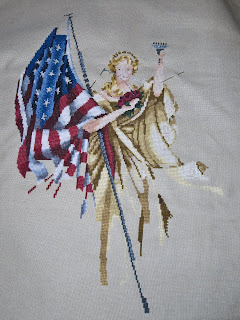 I'm almost to the halfway point on this - just need to finish up the flag and the torch to get the top half done. I think it's turning out pretty well so far, and now that I've stitched on it in Kosovo, they can say when it's raffled that it was partially stitched in a war zone. We were very, very lucky when we pulled into traffic-jammed Budva after our very long day in the car. The first hotel we tried, Hotel Oaza, had a room available and we took it. 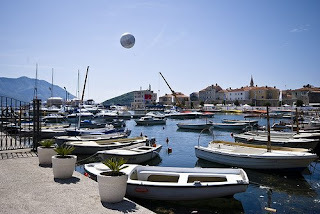 Oaza is located just across the boardwalk area from the marina and about a hundred meters from Stari Grad (old town - all the towns with fortifications from medieval times are called Stari Grad in Montenegro). 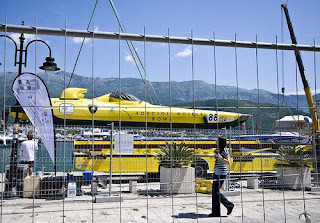 It turns out that there was a World Powerboat Championship race the next day, and the whole town was partying before it, along with a few thousand tourists/race enthusiasts. There was a concert bu Russian girl group (Eurovision contestants in 2007) Serebro (pictured here), a fireworks show, and a bunch of dazzle. So we ate dinner, walked around Stari Grad, listened to the music, and my companion took a lot of pictures. This one is from Stari Grad looking back out across the bay toward the south end of Budva. If you look closely (or at the bigger version of the picture in this set), you can see the race sponsor's name in green laser in the sky by the mountains. Neat trick. After a few hours of the walking around bit, we went back to the hotel for sleep. I'd recommend this place. The room was big, even had two bathrooms (one with jacuzzi), and breakfast was included. I got the second flower done on this before we headed out for the trip, and the third one started. The leaves on it were pretty easy closed fly stitches, and I think they came out pretty well. There's not enough contrast in the raspberry colors for the flower, though. I picked them out of my stash. It looks good, but not as punched up as it should. The bud on the right hand side's started; it just needs its leaves. Or my companion can loan me his micro SD card after reading this entry and let me upload the pictures that way. He had the trout; they keep several schools of them in the aqueducts at the restaurant. You can see them swimming as you come in and at the front of the reception hall across the road. When someone orders trout, the cook literally comes out and scoops one up. 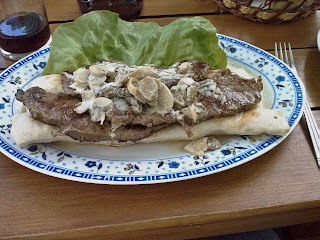 The sauce on the steak was very good and the bread underneath is typical of what you get in Kosovo; several shapes, same bread. It's got a chewy crust and a very white center. We also had salads (huge ones) with the meals. To continue... the restaurant was a lovely little place on the river just past Novo Selo. Its name is Vala & Drinj's and is owned by a father and son. Lunch was delicious. My companion had a trout which he watched getting caught (how fresh is that?) and I had a beef and mushroom dish. The son/brother of the owners came over and talked to us. He was soooo happy to see Americans, especially one from New Jersey. It turns out that he now has American citizenship and lives in Somerville, NJ, where I used to teach high school. He works at a restaurant there called Ciao Bella. I'll have to go visit it and see him. The food at the restaurant really was great and the view magnificent, but you can see the kind of road (track) we had to drive on to get there. 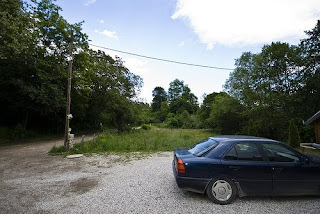 This is typical of both Kosovo and Montenegro once you get off the main roads. 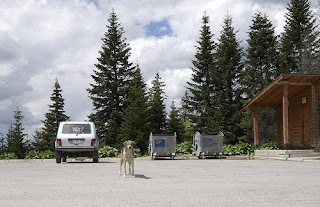 At the Kosovo checkpoint for the Montenegro border, we saw this friendly dog. Her mate and puppies were not too far away in the shade. 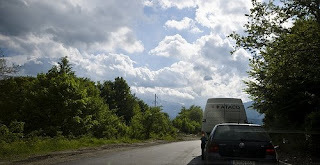 Border checkpoint crossed, we went over a mountain before getting to the Montenegro checkpoint. A whole bunch of hairpin turns and beautiful views in between, of course. If you want to see more of the pictures of this part of the trip,go to my companion's flickr set. There are some awesome shots. What should have been a six hour trip from Pristina to Podgorica turned into an eight plus hour trip due to scenes like this. There were multiple tunnels being enlarged and at every single one of them we were required to stop for up to half an hour to let traffic pass from the other direction. Gorgeous mountain views, at least, but still! Lots of time with the car turned off and just watching things. We get to do this on the way back, too. 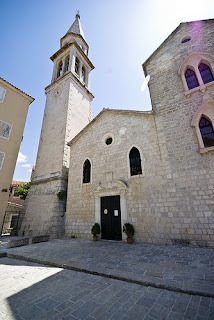 I'll talk about Budva later in the day and post some pictures from that. I'm back on the net for the next three days then off for two then home. We've driven from Pristina to Split! 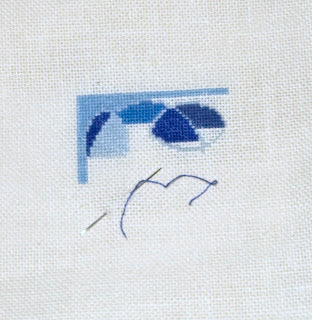 I'll have pictures in the next couple of posts, but for now you're going to have to make do with my stitching. I got more done on the fifth band now, but I'm going to be doing some frogging on it. I really don't like how light the outer hearts are, so I'm going to change them to my medium shade of green. It'll make them stand out more on the gold. Will probably do that tonight or tomorrow night here on the veranda at our hotel. 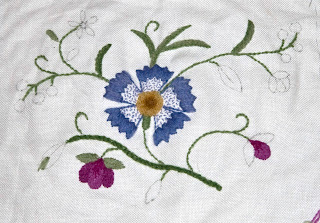 Two more petals done on this; I should be able to get more done on the trip, perhaps even complete the flower. This is my last scheduled blog post. I might not be able to post again until the first of June, as I'm off on an adventure. Will share pictures and such when I get back, if not before. I progressed some more on these bubbles. There are sixteen squares and I'm still on the first. The series ends at the end of the year, too! It's only available in the Marquoir German yahoogroup. I'm liking how it's turning out over one, even if it's going to be tiny. He said he'd be dead instead of fixing my wall. I was told I'd hear people tell tales of gratitude to the Americans, but this was the first one I heard since being here. He told me how the Serbs had burned down his house and he went from cousin to cousin and finally Macedonia to get away from the Serb army. He saw the bombs from the NATO planes fall, and he was so relieved to be able to live. He'd received no real education - the Serbs didn't allow Albanians more than the rudiments. No real future, no hope. All that changed with the Americans. He's worked for the mission for over eight years. His house is very near completion - he's been rebuilding it himself with the money and skills he's learned from the Americans. I felt embarrassed. I wasn't personally responsible for any of the things that happened then, and I'm just here as a guest. We can't understand what they've gone through. It's been a century and a half since there's been a war on American soil. 9-11 is the closest we've ever come. I hope it never gets any closer than that. The whole thing left me proud of my country and embarrassed that I couldn't do more. I got a partial outline of the last garden bit done this week and even filled some of it in, too. Last night reminded me we were not in a first world country, though. The city has regular blackouts due to not enough electricity. The flat I'm staying at, though, has a generator that provides backup power for the building. It runs an average of three to four hours a day. Unfortunately for us, last night when it switched back to city power, our flat didn't get switched. The breaker flipped. It took a couple of hours to get someone with a tool to get into that particular breaker box out here to fix it. Needless to say, we didn't get as much sleep as usual. On the other hand, we went out to eat last night because I was tired of cooking. We went down the street to a little place called Chalet Denis. The menu was in a combination English and German and it had a beautiful red brick oven. I had mushroom soup and a proscuittio pizza. My companion had a shop salad and a Chalet Denis pizza. The soup was as good as any soup I've tasted in France. They used real cream and had seasoned it gently. Was wonderful on a chill and wet day. For some reason, the Kosovar don't consider proscuittio a pork product. Beats me why, but it's on the menu at practically every restaurant. The pizza was good too, with ham and mushrooms on it cooked in the aforementioned oven. I only ate half; the rest will be dinner tonight, since we're going to be a bit busy packing for the trip starting tomorrow. One of the blues is done all the way on both legs. It only lacks a bit on the outside corner top. That means this is coming along pretty well! I also did some more gold on this last corner. 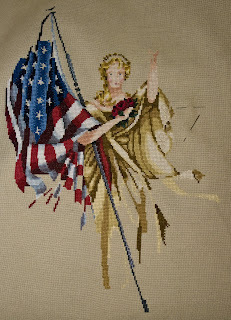 The Lady's face got done this week, and I did a bit more on the flag. It's beginning to come along some and I'm working on it every day here in Kosovo, too. We went to Prizren, in southwestern Kosovo, on Sunday. It's a town at least as large as Pristina and looks to be somewhat more prosperous. There were a lot of people enjoying the balmy weather in town and just as many escaping the heat and going into the mountains above it. This picture is of part of the mountain chain we wound around on the way home. Gorgeous, isn't it? This is another shot from the same place as the first photo. 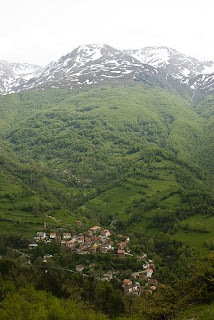 The village at the bottom is only accesible via one road; lots of villages like that in the country. It really makes for picturesque scenery. Up close, there's a lot of trash near and on the road and people do the picnic thing anywhere they can find a clear spot. They bring lawn chairs, some food, and an umbrella, and spend the day. There are also a lot of restaurants with outdoor patios that let you picnic without the stuff. This Roman Catholic church sits on the edge of Prizren's old town. When we saw it was locked, we were going to just pass it by, but someone local insisted that we knock on the rectory door and ask one of the nuns to let us in. I'm glad he did. It was a surprise. While small, the murals were of the caliber found in cathedrals. 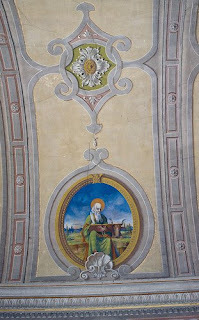 The apostles lined the barrel vault ceiling. As you can see, the colors were vivid and the quality of execution was excellent. The nuns did let us in, very graciously, and even turned on the lights for us. Here is the focal point of the church - the altar is right in front of the mural. 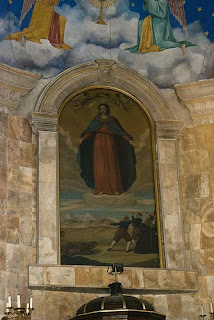 It's of Our Lady of Fatima, and for some reason is much darker than the rest of the paintings. This is what I worked on during my transit time. I did a bit of it in the Vienna airport watching two couples play Hearts at my table. It kept me awake. I'm still having problems with the directions, but what's new? Maybe I'll get more of the flower done this week. 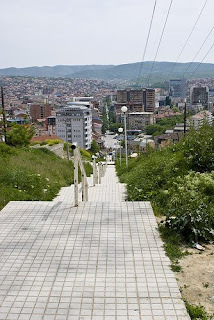 We took a three hour walk yesterday from the flat to downtown (literally, down) Pristina and back. These stairs were the first part of the trip. We took them down, but took another way back. They're the shortcut from our hill to downtown. All in all, they're about a quarter mile of stairs. 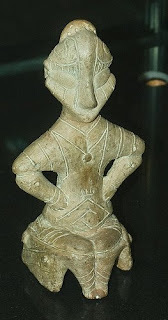 This little goddess is what they're trying to make as one of the symbols of Kosovo. It's a neolithic find from somewhere around here. The provenance on the museum pieces left a -lot- to be desired. Anyway, she sits in the state museum toward the front. The first floor of the museum is archaeological propaganda. 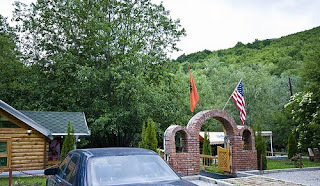 The second floor is an homage to the Kosovar Albanians who fought in the recent war. It'd be nice if at least the archaeological part wasn't so tainted with nationalism, but what do you expect from the national museum, I guess? 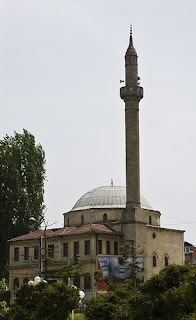 I was told this is the minaret to the oldest mosque in town. (And I was just corrected by the same person who told me so that it might not be; there is possibly one older.) Needless to say, the minaret's a rather new reconstruction. Looking through the windows to the entryway to the mosque, it looked shabby, as if neglected. Perhaps they will refurbish it when they become more integrated into the economy of Europe. 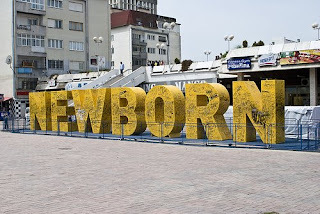 The Newborn sign sits right in front of a shopping center and next to the American school. It's covered in celebratory graffiti, and they're looking for a permanent home for it. The sculpture was unveiled when they declared independence in February. The third side is done! Only one more side to go, and a fair start on it already. It feels odd to still be working only on parts two and three when part ten? is out, but that's the way I go always. Maybe I'll pick up speed. 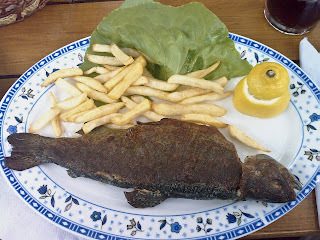 I had my first dinner out in Kosovo, at a restauraunt up the street from where I'm staying. It was a nice place and the balcony had an excellent view of the city. My companion, though, left his camera, so no pictures. We're going walking today, and I'll make certain he brings it this time, else I'll threaten to take photos with my phone. He'll be horrified. I'm here in Kosovo now and it's a bright sunny day out. This piece, though, is languishing at home and missing me. I did some more on the flowers and such before I left, though. All the plaques are done and I'm thankful that I didn't work with just celedon this week. I added in some pink. I still plan on finishing this this summer, and it will probably be my big push project while I'm in Europe. Still plugging along on the fourth corner. 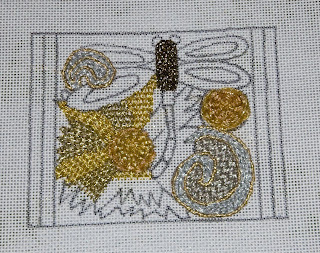 The top leg is about done and this is going in my carry on along with the dragonfly buckle. The top leg is only missing one color of blue and more gold now. Maybe I can find some time and lack of tiredness to work on it as I travel. Yes, this is a pre-written blog entry. I'm writing it on Tuesday so it will publish on Thursday while I'm still somewhere over Europe or stuck in an airport, probably Vienna. This week I added more hair and face along with some more blue on the flag. Not as much done as usual, but it's been a busy busy week. I did a lot of French knots in the middle of this and it made the flower just pop. I took it to my chapter meeting last night, and the ladies remarked on how curly the knots in the center were. It's coming along and will be going to Europe with me. This is the mystery with the fourth part done. It's already in Europe waiting for me! I mailed some stuff last week, including this after taking a picture, since I'm all caught up with it and the next part doesn't come out until Thursday. Now it's all waiting for me. It still amazes me how the outlining on these turns them from blobs of color into frogs. This is the project I had to get done before I left, and one I'd only started two weeks ago. I got it done, though! 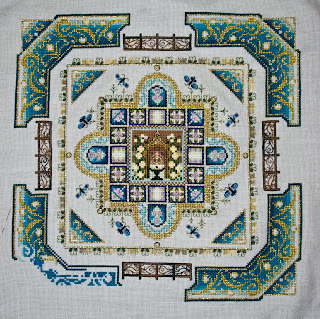 This week I'm back to green colors and all backstitching. It's coming along; I have all the big hearts outlined on band five. After doing the hearts, though, I'm thinking of redoing them in a darker green, the medium color used in Band 1. Then again, I might not. I'll have to see if they get more visible when I add the flowers. Well, I got the body done and I think it looks good. The stitch guide is still giving me fits for ease of reading and organization. 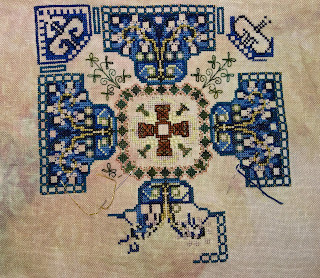 I don't like harping on things like this, but if I'm having problems with it with over twenty years of stitching experience and a science degree, how many others are having it worse? I'm working on the flower now, and they didn't send me one of the colors of FyreWorks I need. I found an acceptable Kreinik substitute in my stash so I can take it with me to Europe in two days. It's really disappointing to have to go through these kinds of problems. This picture was taken on Friday early in the evening. I finished the piece about half an hour ago. Now I don't have to send it back to get framed; my husband can start next weekend. The fourth of five bands is done. Of course, the fifth band is rather large and I'm leaving in three days without this project. I had toyed with finishing it up before I left, but my husband requested I get a different one done (a gift) so he could frame it while I was gone. At least I got that one done today ... Oh well, I'll finish this up when I get back in the summer. I've really liked doing the string art and this was the first time I've done a triangular Jessica. 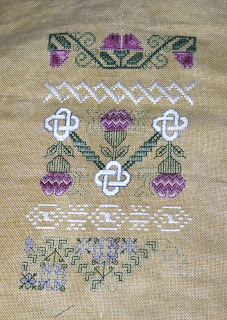 This is another pattern from the German group. It's called Bluebber Blaesen and is an abstract design. They had three colorways; I chose blue. It's supposed to be done on 14 count aida, but me being me, I had to change something. I'm doing it over on on 28 count lugana. I think it's coming out pretty well so far. This is the first of twelve parts. I have to finish this part, take a picture, and post it, before I can go on to the next. Still working on the third side of part three, but the end's in sight. I've got a bit more done on the fourth side, too. Maybe I can finish the third one before I go on Wednesday. There are a few pink flowers and a couple of blues to do. Got some more done on the insides. The turquoise is done but for a very small piece of the third opening. Just as I'm feeling I'm making decent progress, I'm abandoning it for six weeks. Dang! But I really can't take everything and this was a good project to leave behind. I added more celadon this week to the plaques and didn't get much more than that done. It's still making progress. Perhaps I'll finish this piece while I'm in Europe. Since this picture, I've finished off the outlines of the plaques across it. Now to fill them in. I filled in one arm of the darkest blue this week and added some more gold. It's to the point where I'm going to probably sit down and just finish off this quarter, so I can -finally- be done with part five. I believe this was the largest part of the chart. I've been catching up with the rest of the group on this. It It's coming along pretty well, I think, and I still like my color combination. It'll be coming with me to Europe. This week I ended up working mainly on the Lady's face and hair. It's adding a lot of personality to have them up. It also means I'm getting close to having the top half done! Yes, the Lady is going with me to Europe. If you've been reading my blog for a while, the frog looks familiar. I made this Tree Frog Trio for my son last autumn. My sister in law saw it on my blog and told me how much my niece liked it, so I offered to make them again for her. I started last Wednesday and am already done with the first one. Maybe I can finish it before I go to Europe, but the more likely scenario is I'll mail it home from there.